My part of the proposal is out the door so I made it home at a reasonable hour and managed to make some progress in the shop. 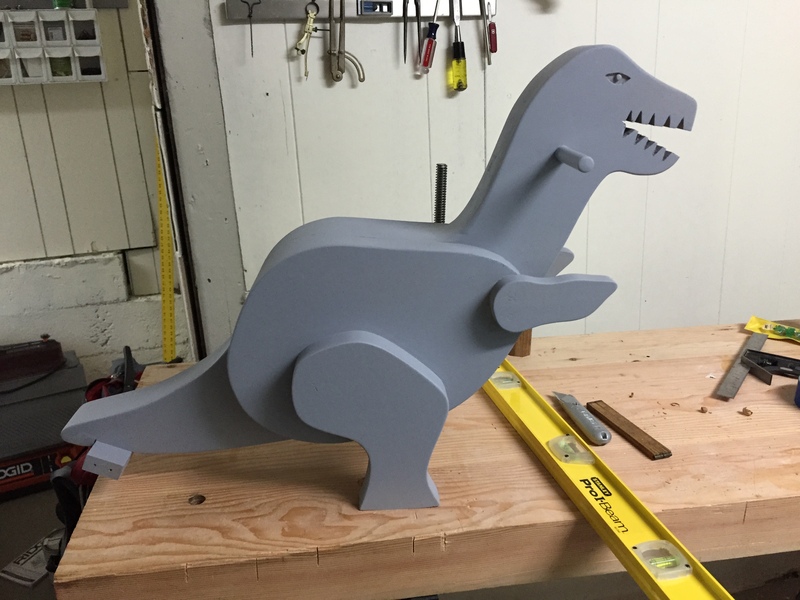 Dino got a light sanding and a light coat of primer followed by black on the handles and tail support piece. This weekend he is getting a full coat of paint so I wanted the black to have sufficient cure time so I could tape them off; most of the evening was spent on the Moxon vise. 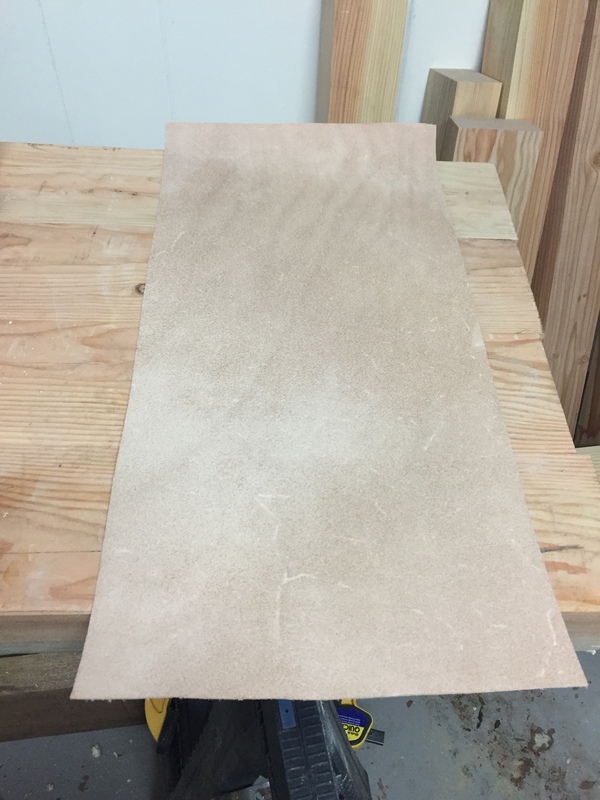 I ordered a 12”X24” piece of split leather from Amazon last week and while it is not enough to cover the entirety of the inner jaws, it will be enough for most woodworking (I have not tried but I think the jaws are wide enough for sharpening full size saws). I split the leather lengthwise and laid out where the leather would go on each jaw. I then smeared liquid hide glue all over these areas (using my gloved hand), laid the leather out on each side, and pressed the pieces in place with the vise itself (with parchment paper in between). 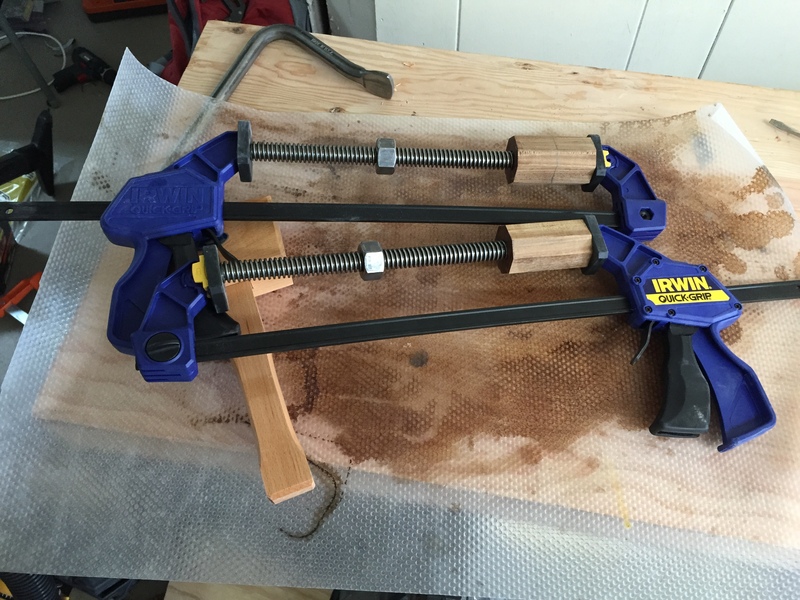 Once that was clamped up, I took one of the clamping notch offcuts and sawed off two squares which were slightly thicker than the Acme nuts. After planning them smooth I split them down the middle which gave me two rectangular blocks the same thickness. 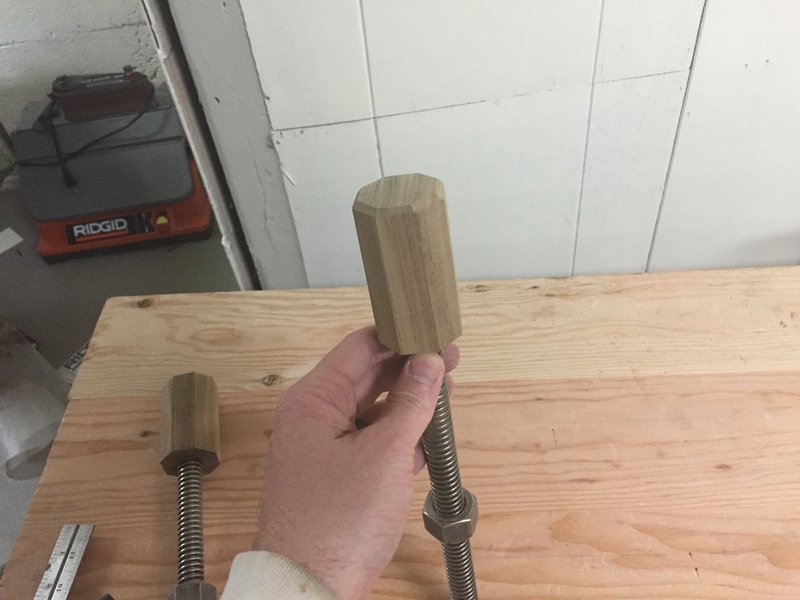 These I then clamped on either side of the nut and then clamped to the vise itself creating stop blocks to keep the nut from turning. 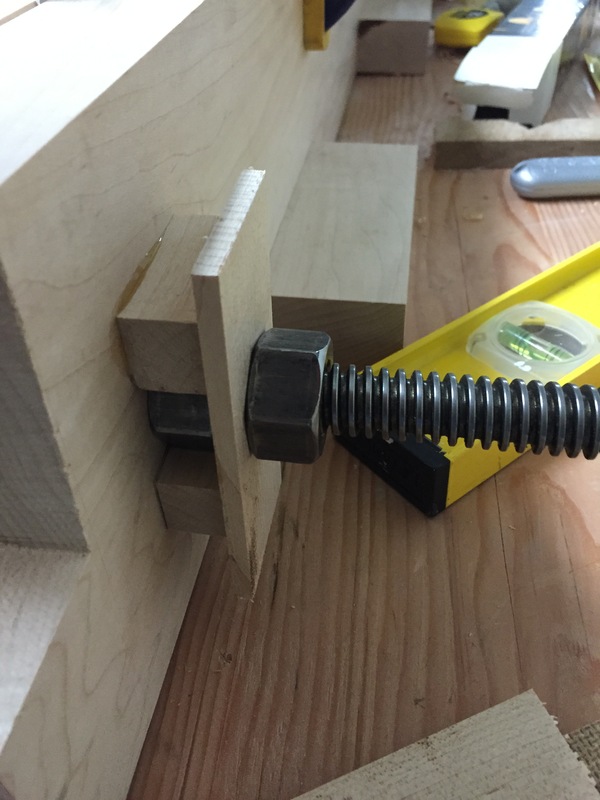 These blocks will then be capped by a strip of maple which will hold the nut against the rear jaw. 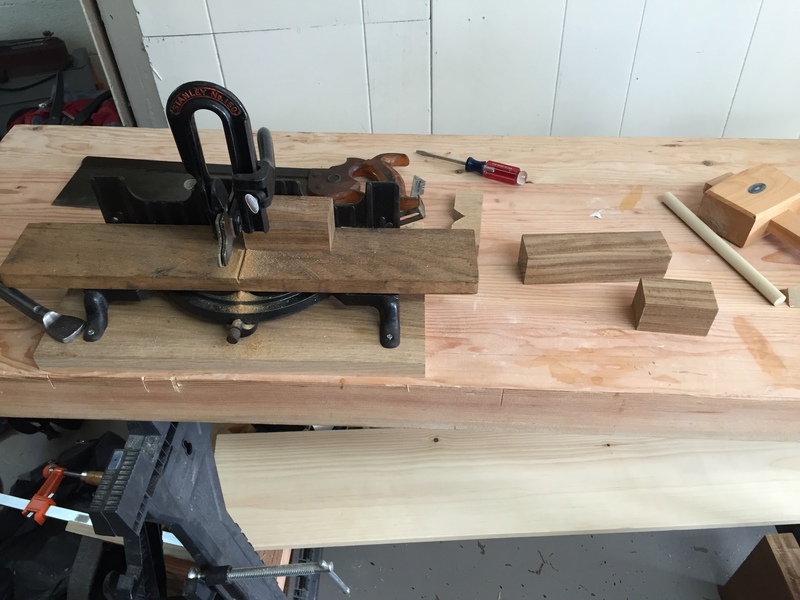 Unfortunately, I ran out of clamps after the first one so I decided to rough out the strips and use one as a clamp for the second set of blocks. 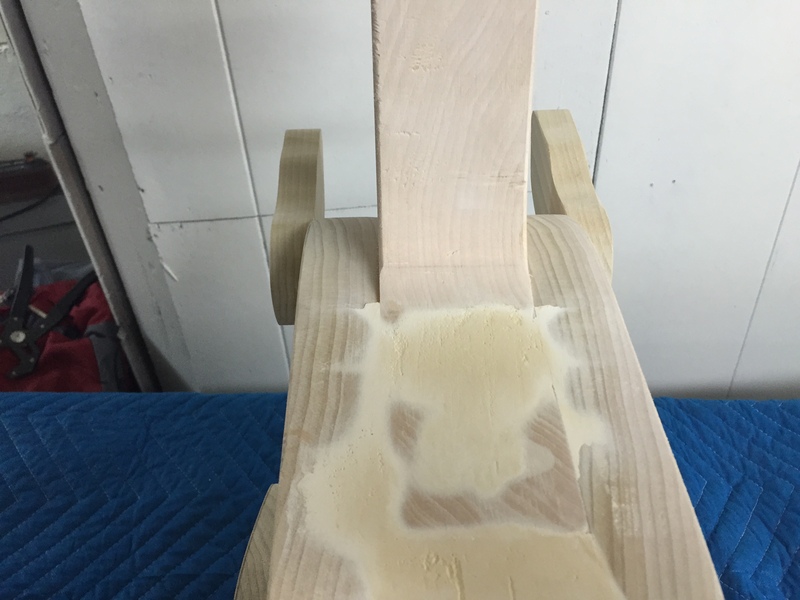 I have some maple left over from the Rocking Dinosaur rockers and one of those strips was a little less than a quarter inch thick and slightly wider than my stop blocks. I grabbed my ¾ inch auger bit and my 8 inch brace and went to work. 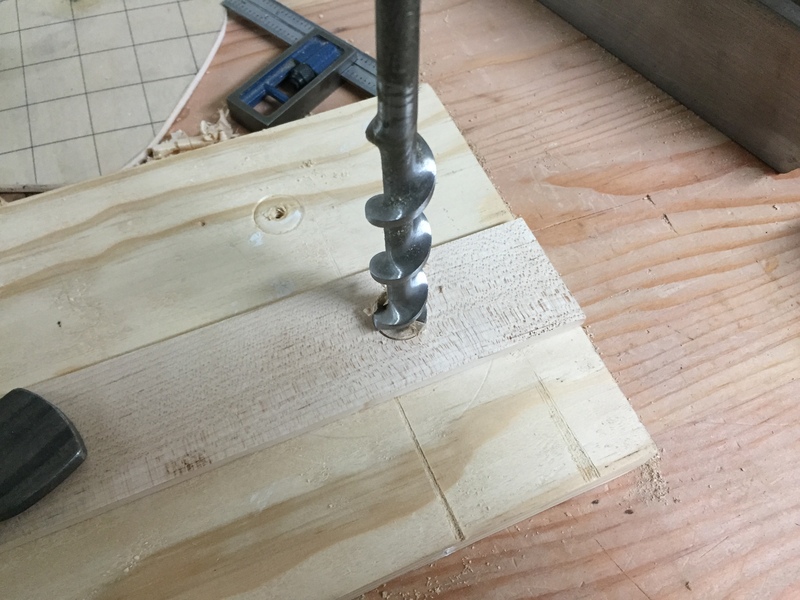 The feed screw had not even gone half way into the wood before it split along a grain line; since my maple strip was thinner than the length of my auger feed screw I decided to try something different. 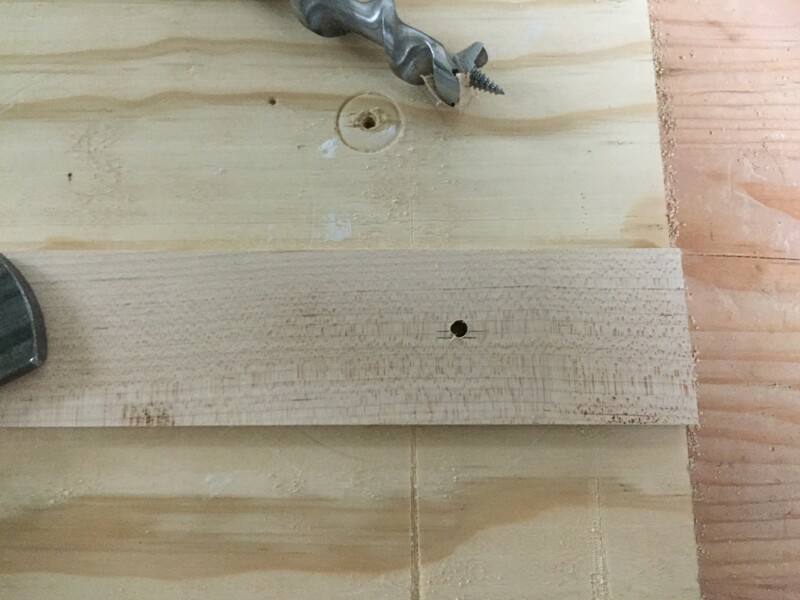 First I drilled a pilot hole in the wood using a standard twist bit (it’s the bit that happened to be in the drill). Then I placed a piece of scrap pine under the maple and locked it down hard with a holdfast. 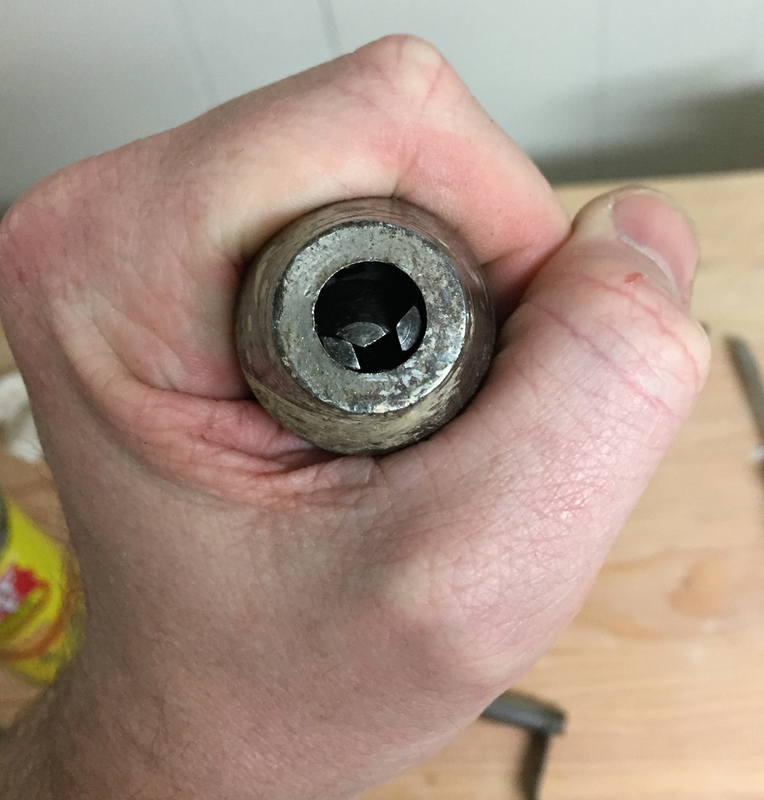 The pilot hole was slightly smaller than the feed screw so the base of the screw started to catch on the maple and the tip of the feed screw dug into the pine and pulled the auger bit through the maple. I doubt I am the first person to try this but it sure worked well for drilling large holes in thin material. 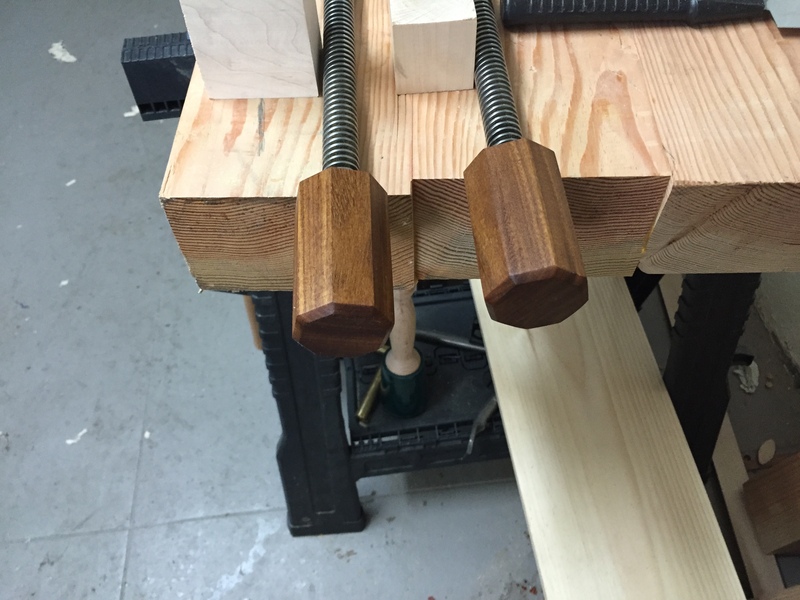 Now that I had my top piece I was able to glue my second set of stop blocks into place. I will trim up both top pieces tonight and glue them into place. It was a nice weekend in the mountains but we did not get home until late Sunday night and unfortunately work has kept me busy the past two nights putting together a pitch for an interesting project. I did sneak down to the garage for a bit last night (after a 4.5 hour conference call that ended at 8pm). 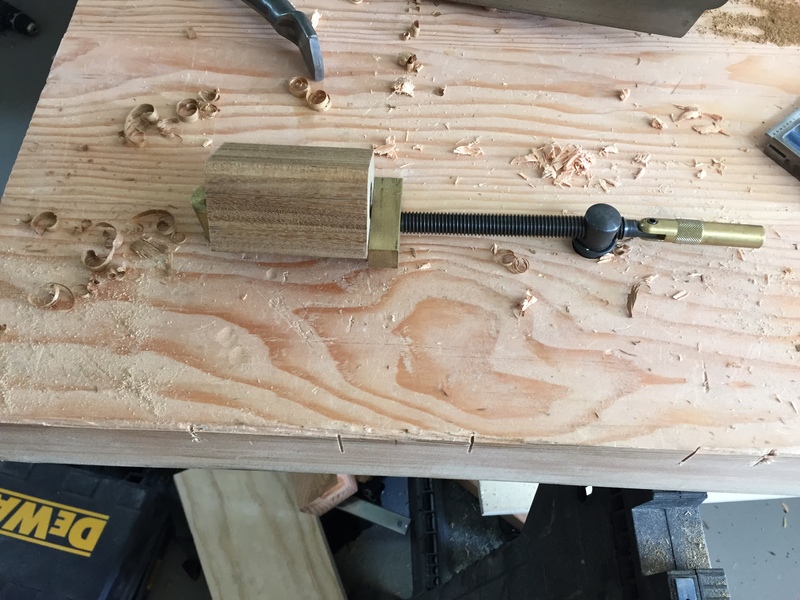 I started to make the chamfer on the front of my Moxon vise. These will be stopped chamfers with lamb’s tongues at the transitions. 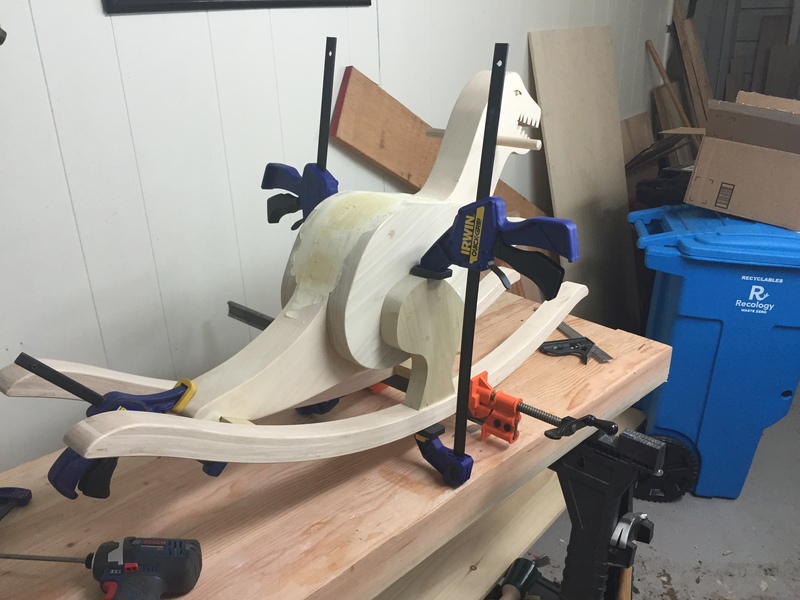 The Alaska Woodworker and Chris Schwarz have nice tutorials on pulling this together. 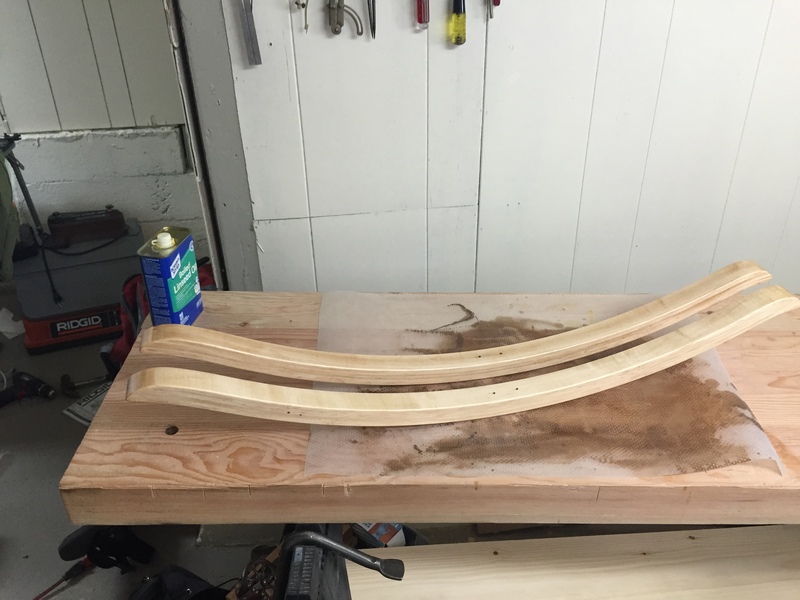 After laying out the curves I made the first but with my backsaw and then chiseled out the first part. 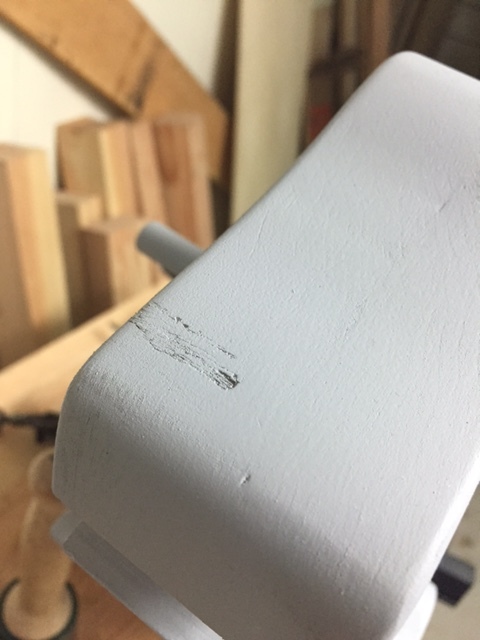 Chis uses a cooping saw to remove most of the waste but unfortunately mine has died and the replacement has not arrived, Alaska Woodworker used a draw knife which I don’t have, I decided to just use a spoke shave (this was a mistake); it is going to take be a long time to remove the material. I also added so filler to some defects that appeared on Dino after applying the primer. Hopefully I will sand these down tonight and apply a bit more primer to those areas. 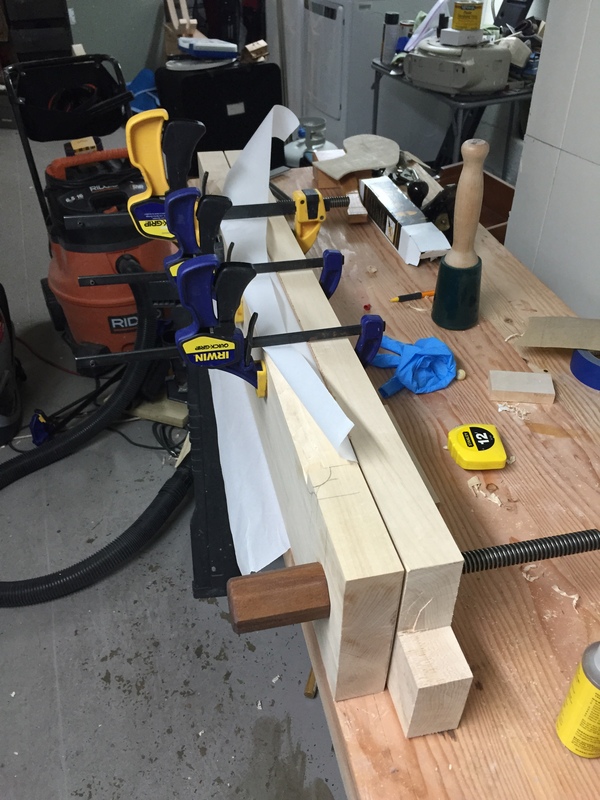 The Moxon vise is almost functional. When I milled up the front and rear jaws at TechShop there was a large cutoff piece from the front jaw. 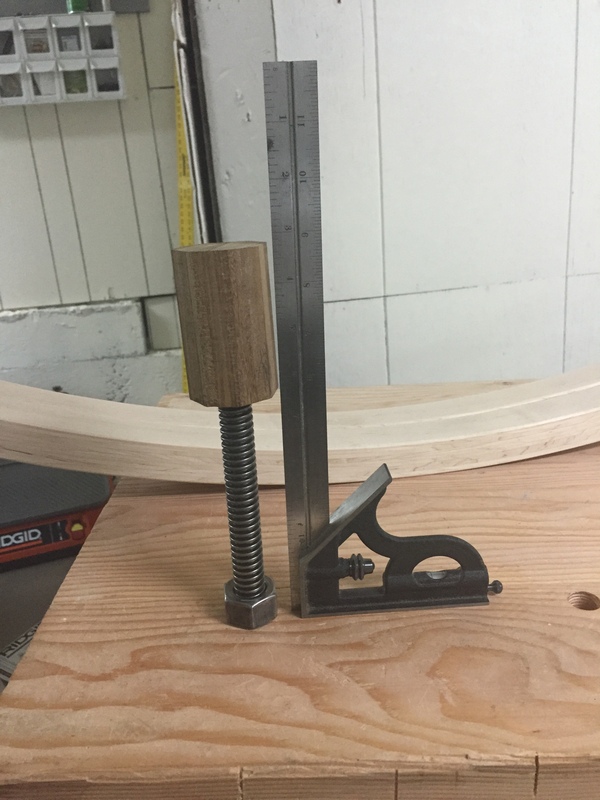 I decided to split this piece on the band saw to use as the rear support/hold-down point. Yesterday I squared these blocks up, smoothed them with my #4, and used some liquid hide glue to attach them to the rear raw. The Veritas Wonder Dog is great for holding small parts. After that I sanded the African Teak handles with 100 and 120 grit sand paper and applied a coat of BLO which gave them a beautiful color and a pleasant tactile feel. 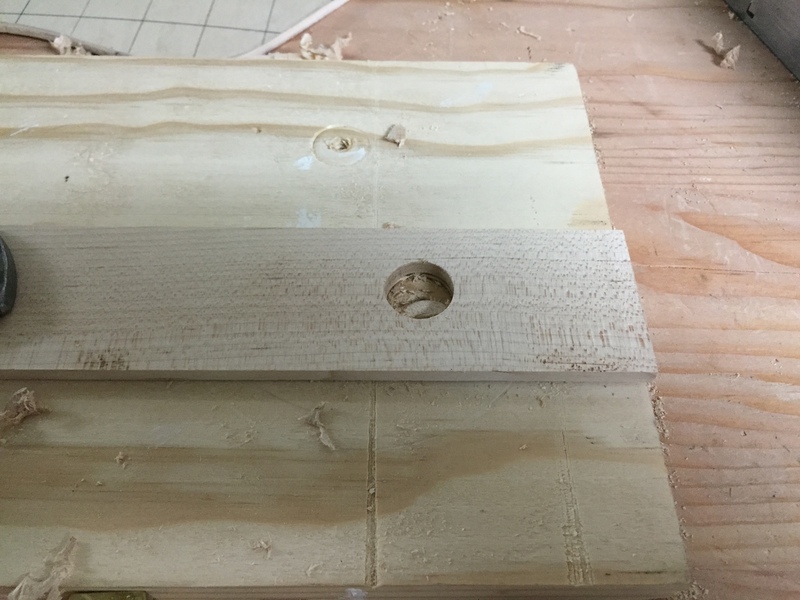 I have a large block of this stuff left (you can see it under my work bench above) which I plan on using for other handles in the future and a smaller piece that I plan on making into a panel gauge if I ever get caught up. 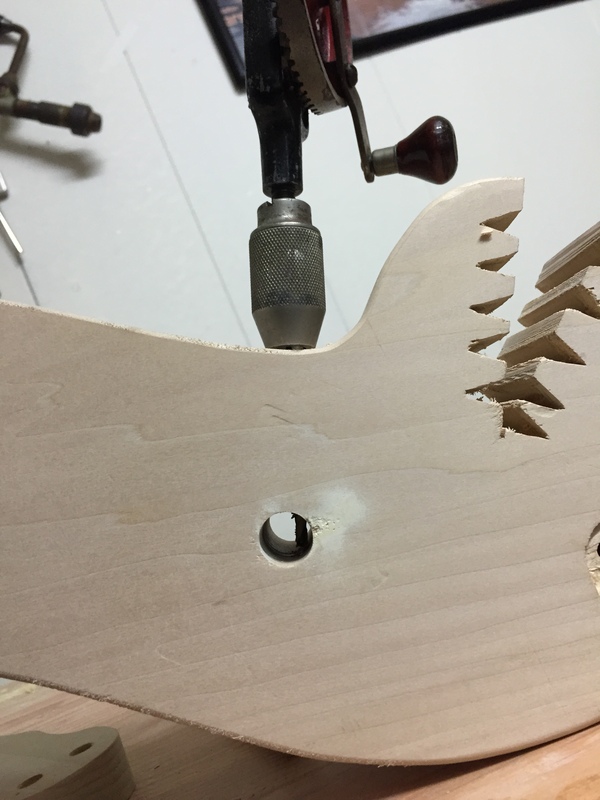 I also managed to drill screw holes in Ralf’s rockers; the new Franken-drill did a great job and it is much easier to work with than my old #2A. This is going to be my last post until sometime next week as I have a work even tonight (drinking and woodworking do not mix) and then tomorrow we head up to lake Tahoe for the weekend. Last night I had planned to do a bit of work on the Moxon vise but two packages arrived at the office right before I headed home. 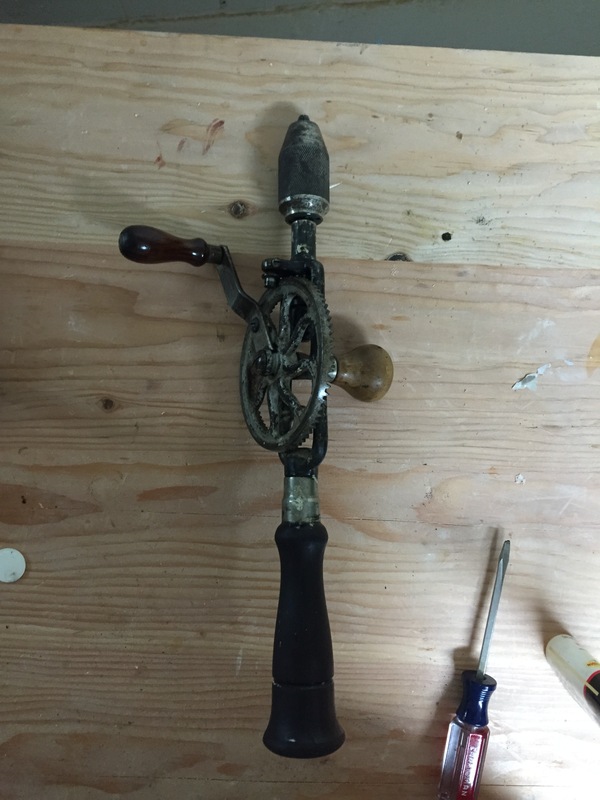 One was an e-Bay purchase and the other was a package from Bill Rittner at Hardware City Tools so the evening plans changed to tool repair/restoration. 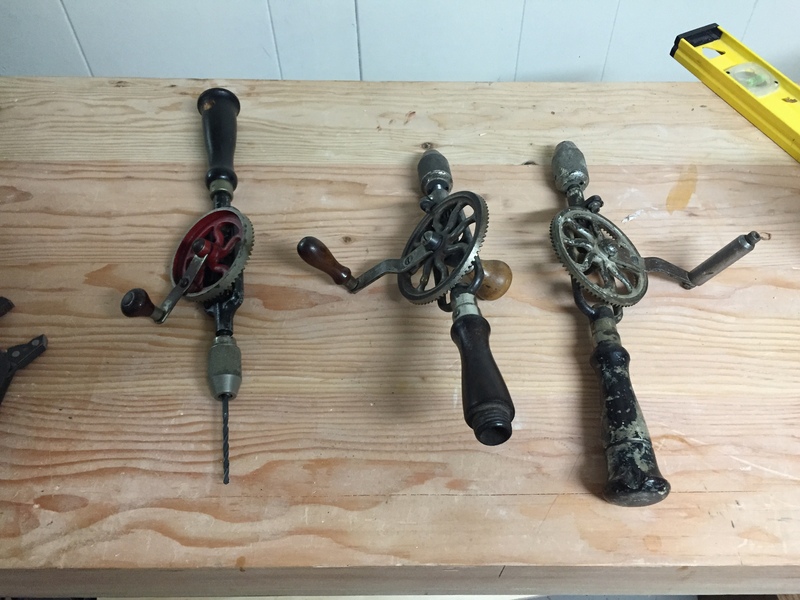 As I have previously mentioned, I am fond of my egg-beater drills and I think they work great however, each of them has some problems: my #5 is missing a chuck spring and my #2A is missing its LRRCW. Well no more, both of these problems have been solved. 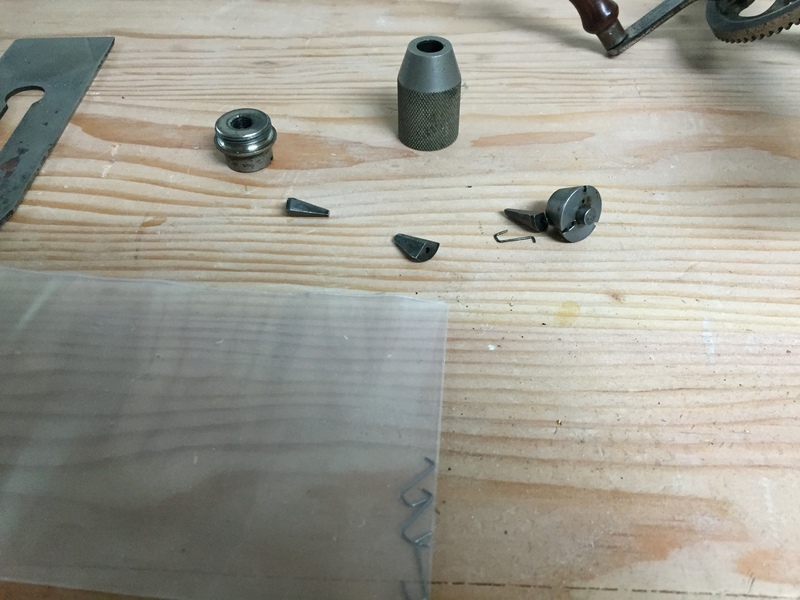 Here are the patients for this evening; from left to right we have my Millers Falls #5 with a ¼ inch chuck, my original Millers Falls #2A with a 3/8 inch chuck, and my newly acquired Millers Falls #2A, also with a 3/8 inch chuck. First the #5: I thought I could live with its missing chuck spring (I got it for cheap) but alas it started getting on my nerves so I ordered a new set of springs from Hardware City Tools (along with a replacement tote for my Stanley #8). Disassembling the chuck was very straight forward (Bill has a nice walk-through) as this is a “newer” model which used a slot instead of two holes and it just so happens the slot is the same width as an old #5 Handyman plane iron I had in my spare parts pile. It was a simple matter of swapping out the old for new springs and cramming the suspended jaws back into the housing along with the 3-in-1 oil and screwing everything back together. 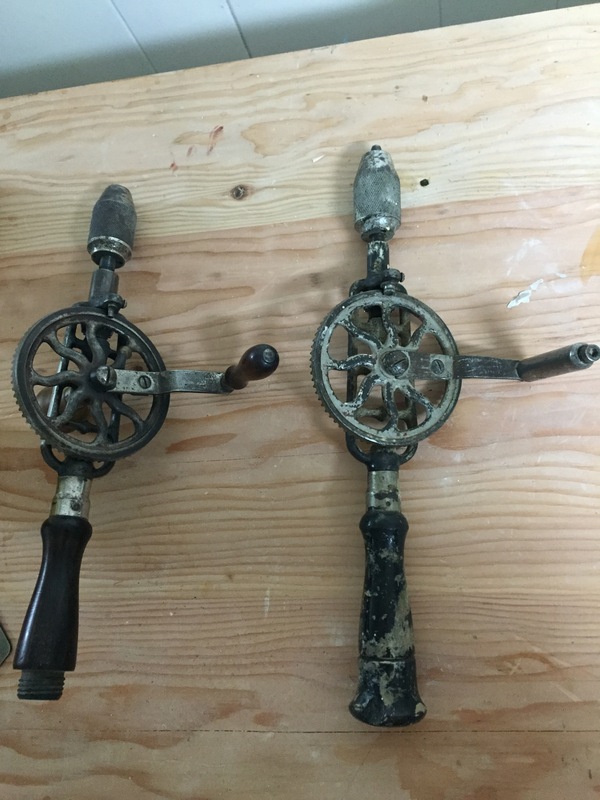 For some reason, Millers Falls #2A drills in good shape with a LRRCW have started going for stupid amounts of money on eBay so I decided to buy a couple of less desirable examples and try to restore them. Both of these drill cost less than 15 bucks because they have problems: the left one is missing its LRRCW, has had a previous drive gear repair, and is missing the handle end cap; the right one had a terrible drive handle, is missing a chuck spring, and is missing the side handle. After stripping down both drills I determined the gears on the new one seated together better so that frame became the basis of the new drill. After Goo Gone and Goof Off both failed to remove the paint from the handle I pulled out some sand paper and discovered that what I assumed was a painted handle was actually rosewood so I wet sanded it with some BLO and will eventually add a shellac top coat. The old drill’s chuck, drive handle, and side handle were moved to the new frame and after some oil and adjustments I had a very nice new drill. I did identify one problem with the new Frankenstein drill, the main shaft threads on the donor frame are damaged right at the base near the frame; this did not cause any problems with the previous chuck as it was a slightly shorter design however, when the new chuck is tightened completely this damage introduces some wobble. I am hoping this will not cause any issues as I typically use my #5 for small drill bits and the #2A for larger ones. It was a beautiful sunny President’s Day here is San Francisco so we decided to make a family trip to the zoo, unfortunately so did several thousand other people and that plan was changed to a hike through Land’s End which is a hidden gem. 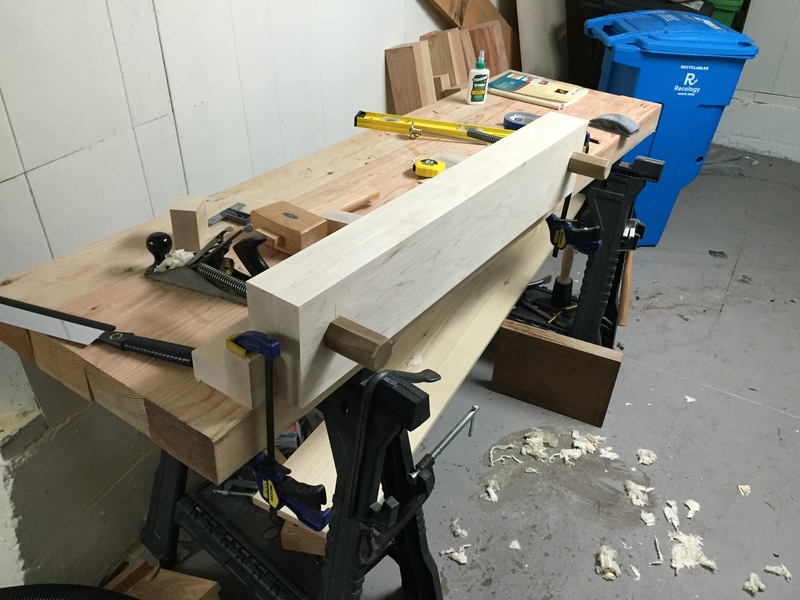 Long story short, no progress on anything during the day but I did sneak in an hour working on the Moxon Vise before bed. 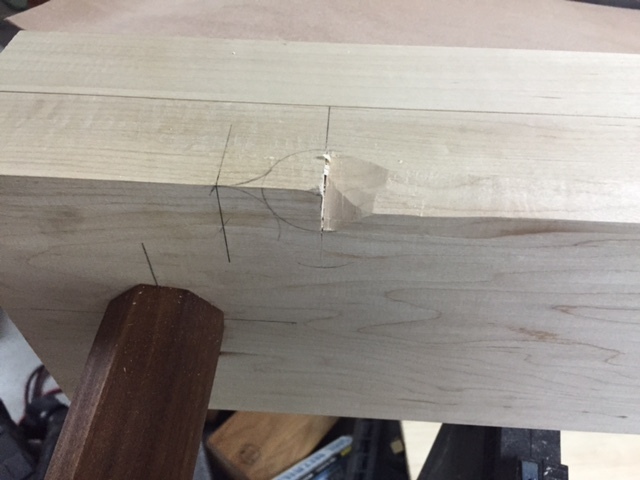 After checking the epoxied handles it became clear that the screws and wood were out of alignment so I checked each facet against the bench top and marked which end needed to be shaved down. This is the first time I have used African Teak so I am not sure if this is normal but this stuff loves to tear out and there are a few places with severe grain direction changes so the oscillating spindle sander got some more use (have I mention how much I love this thing?). 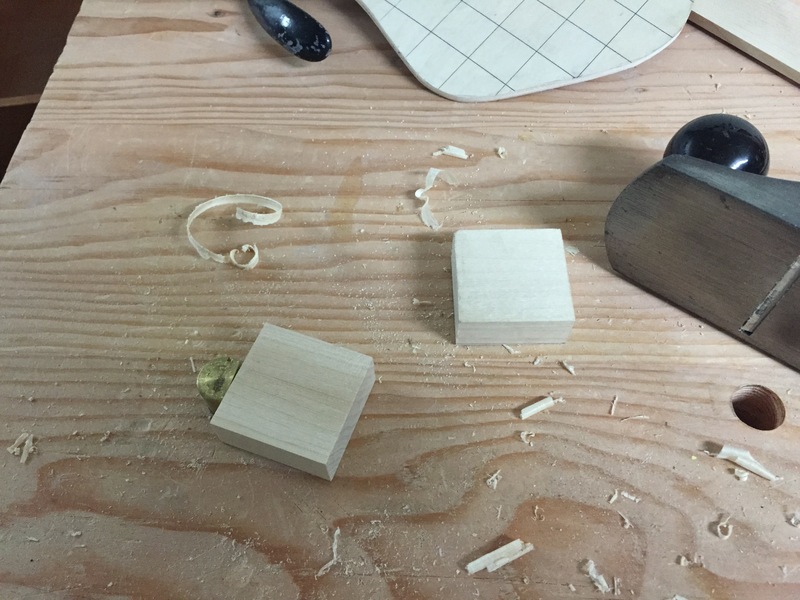 I squared up the facets by eye then measured each one to ensure they were all close to the same size; then I made a line along each one with my marking gauge, adjusted the sander top to 45 degrees, and added a nice bevel to each facet. 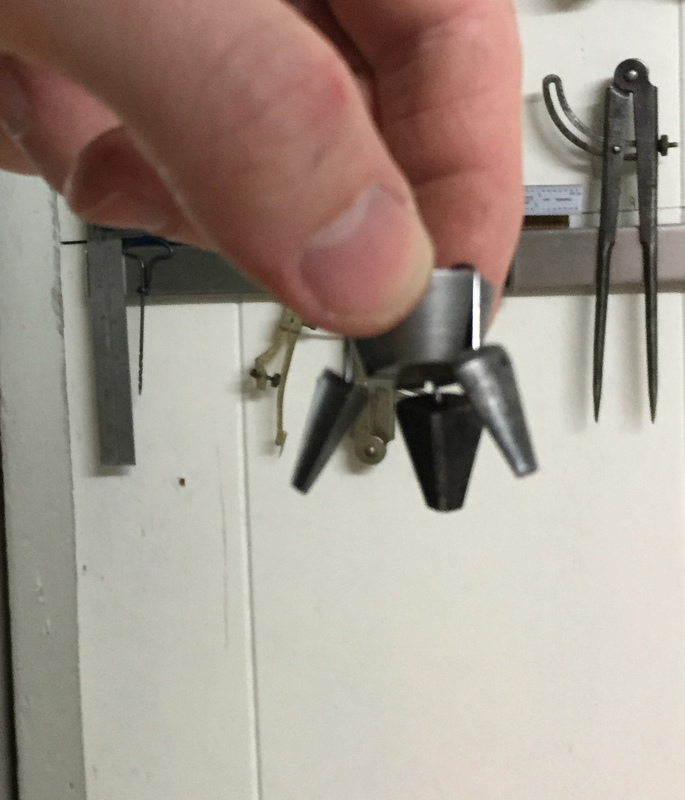 I then slid the handle threads through front jaw and then threaded them through the nuts held on the rear jaw (these are not attached yet) and tightened the jaws together. I then marked out the edges of the front jaw so I could cut the clamping notches. 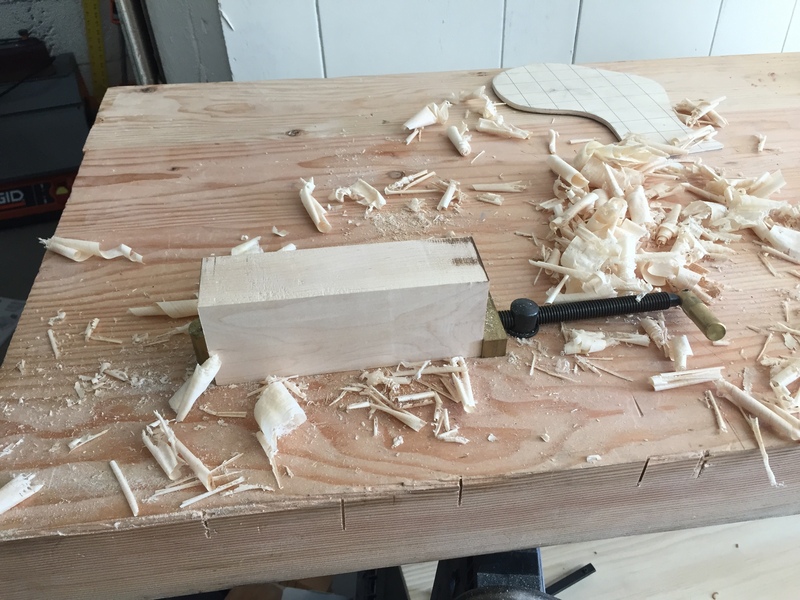 My Bad Axe carcass saw is filed with a hybrid tooth which should work well for both ripping and cross cutting and while it cross cut the hard maple like it was butter, it bogged down a bit on the rip cut. 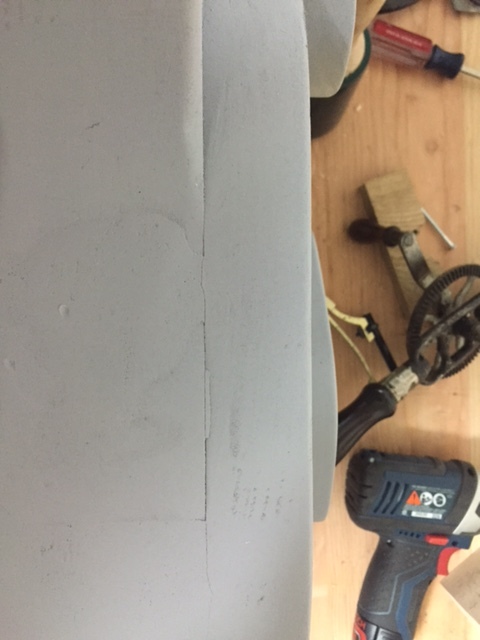 I laid out the notch to be half of the height of the rear jaw however; the height of my saw plate is slightly less than that meaning I had to finish the cross cut with a backless pull saw. 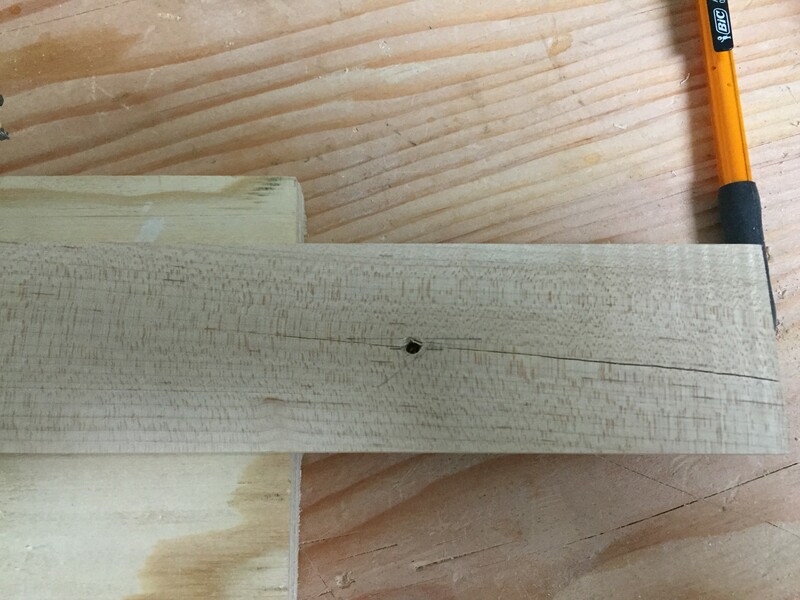 My sawing skills are still developing, the first notch went a bit out of square but the second is dead on, I think I saw better when the line is on the right side of the saw. 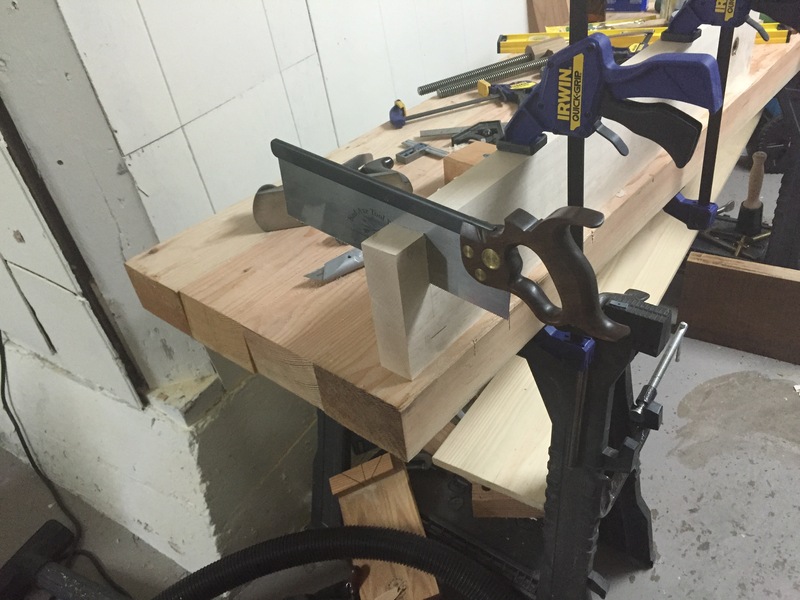 The top edge of the front jaw did not line up exactly with the rear jaw so after using the newly cut notches to attached the vise to the bench-top I planned down the front jaw until they met up perfectly. 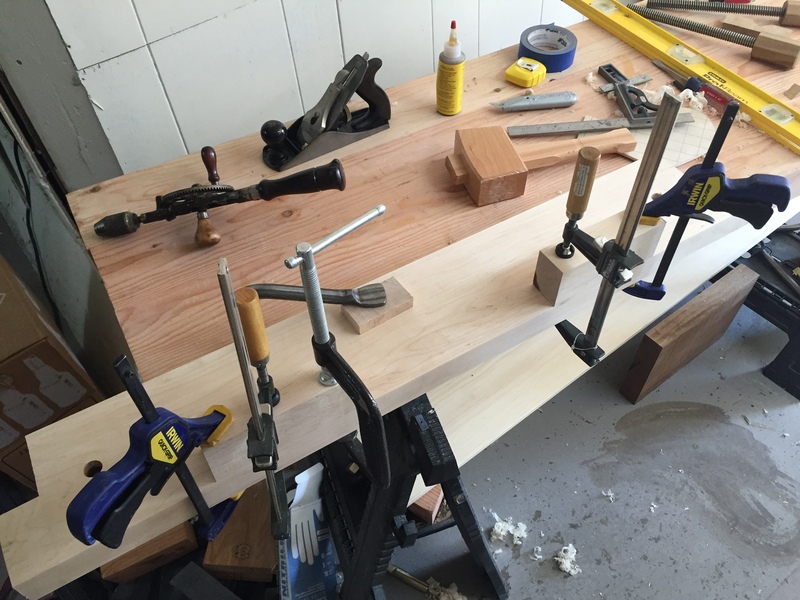 Now I need to attach the back support blocks where the holdfasts will eventually be used to secure it to the bench-top; cut the bevel on the front; attach the nuts to the back; and put some suede between the jaws. I am very pleased with how the handles came out. I had planned to bore a ½ inch hole through each one for a cross piece but I think I will leave alone for now; I can always add one later if I change my mind. 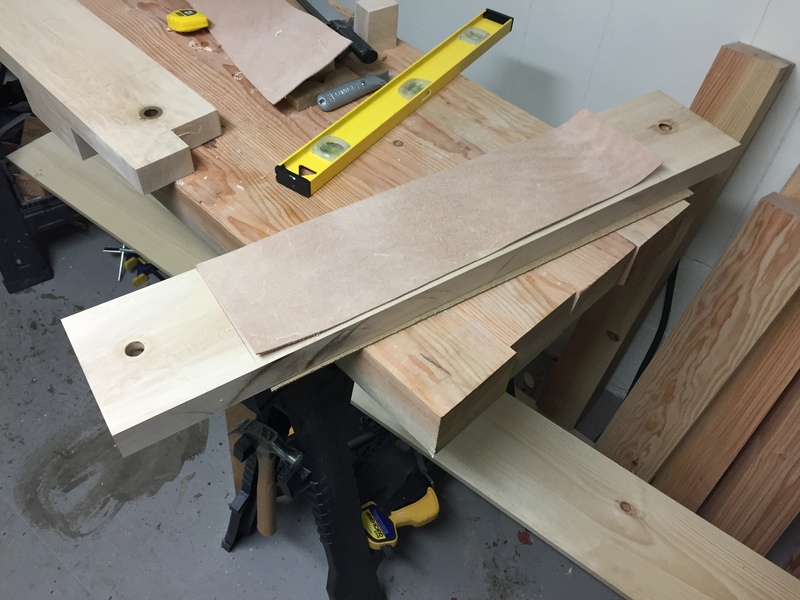 Also, planing the top edge showed the limits of the my sawhorse supported bench-top and the milled legs along the wall are practically begging to be finished. I had a long Sunday morning of sanding and shaping and Dino’s rockers have a coat of oil and the body has a coat of primer (on Friday we named the pair, Dino is the prototype and Ralf is the second one). First I trimmed the throat plug and did one last test fit to drill the tail blocks attachment holes. Then after sanding by hand from 100 down to 180 I applied a coat of boiled linseed oil and set them on the shelf to cure for the next week. After a short break I tackled the body shaping. I had applied a bit of filler in the low spots the previous night so I pulled out my rasps and smoothed the transitions between the various body parts and then sanded everything down to 180 (unfortunately I forgot to take a picture of the neck transition before primer). After a coat of primer it is clear I have a couple of areas that need some extra filler and some sanding so I will let it cure for a couple of days before sanding it down. 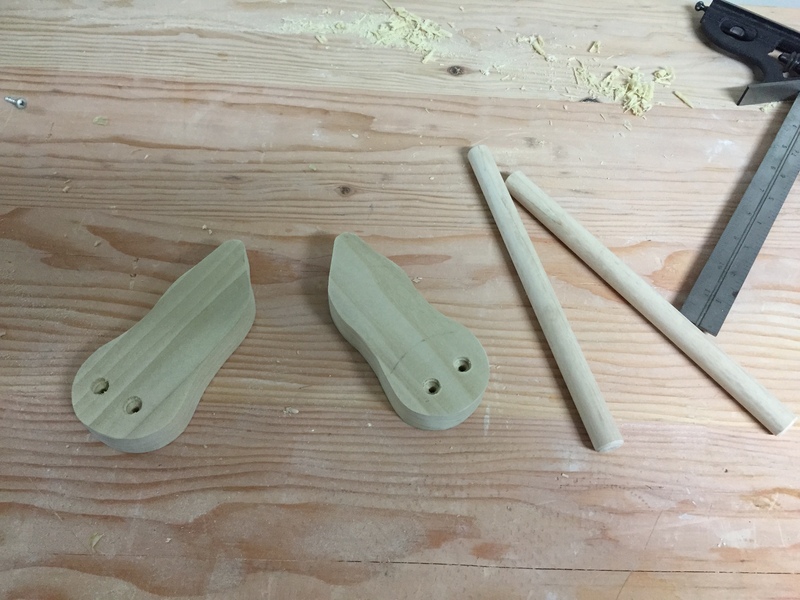 I still had a bit of energy left so I did some work on my Moxon vise handles. I decided the cut them a bit shorter and make them into octagons rather than making them round. Then I epoxied them in place. 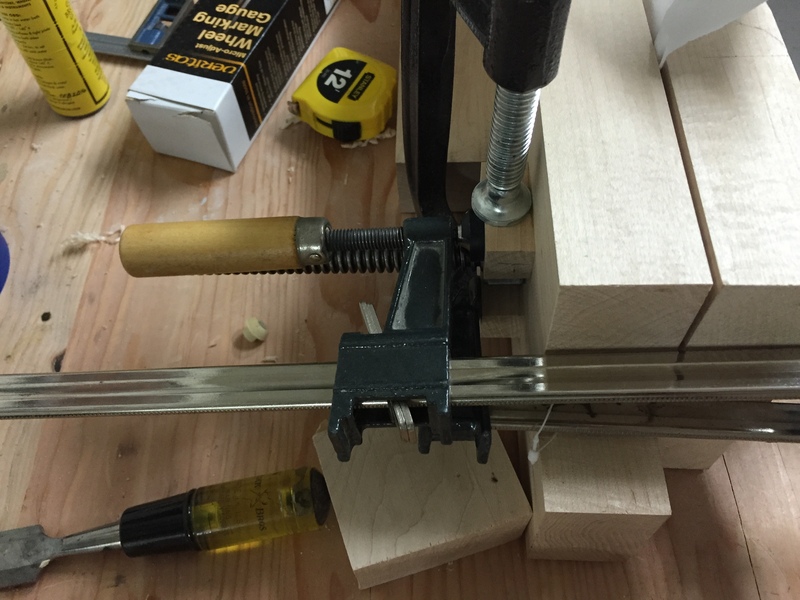 When I got home from work last night I discovered that the hard maple dowel I ordered from Rockler had arrived and it was noticeably stiffer and more solid feeling that the poplar one from the hardware store. After the kiddo went to bed I headed to the garage and cut two handles and rounded out the arm tips on the oscillating spindle sander. Next it was time for a tracheotomy; a screw will hold the handle in place. Unfortunately my aim was a bit off but I managed to find the handle hole. 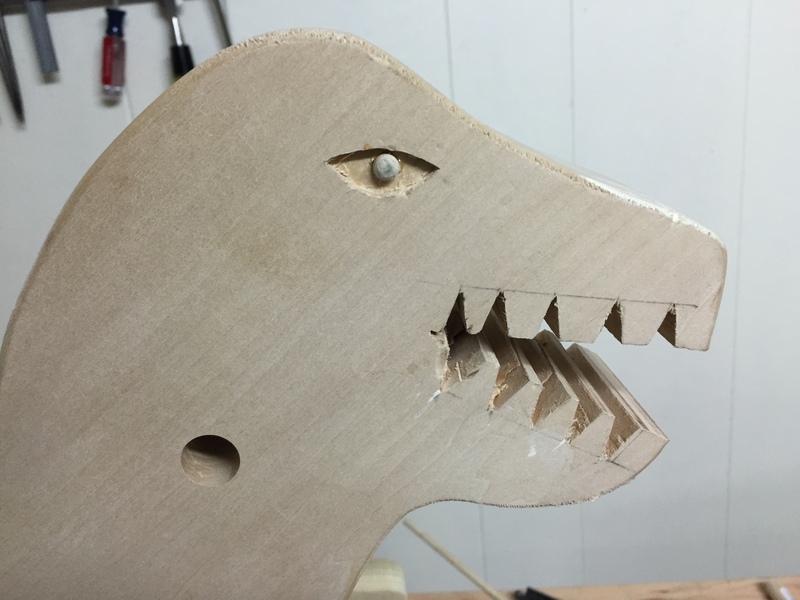 I still need some longer screws so the handle did not get installed but I did get the rounded over dowels installed for the pupils. 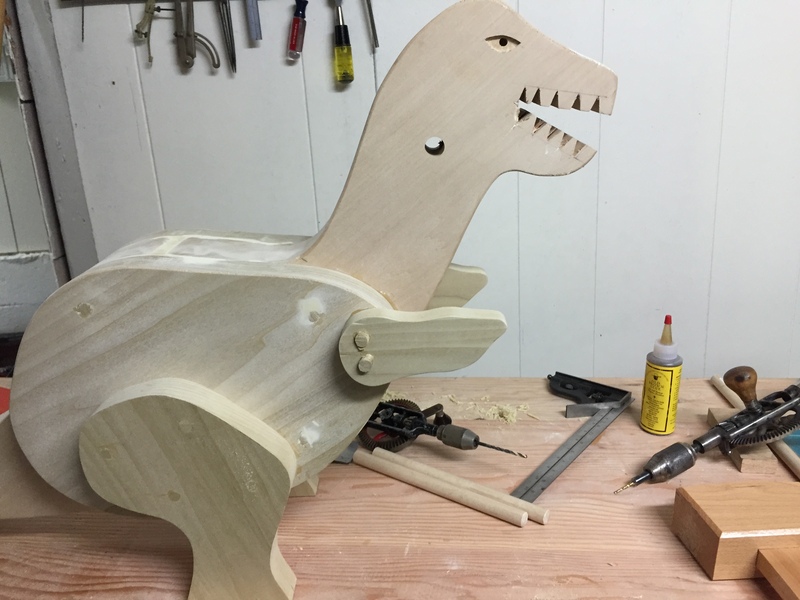 I have one goal this weekend, to get the prototype dinosaur body primed and get the rockers coated with boiled linseed oil. That means a lot of sanding will need to happen this weekend.